Recycled Paper Stretch Bracelet, "The News is Hot"
Making a statement for ecological responsibility, Francis Oliveira designs a stunning bracelet. The cylinders are hand-made from recycled magazines, which give it the name "News." Glass beads complete the original design. 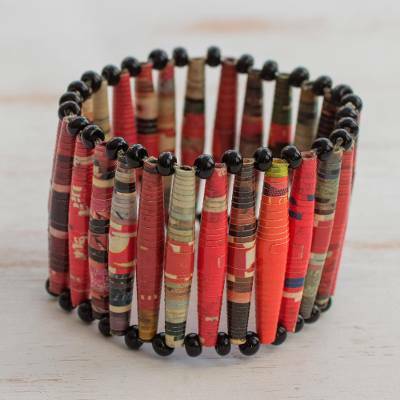 You can find recycled paper bracelet 'The News is Hot' by Francis Oliveira in jewelry categories such as Eco-Friendly Bracelets, Glass Bead Bracelets, Paper Bracelets, Stretch Bracelets and Wristband Bracelets. Enjoy exploring these sections for other Novica treasures. This is a whimsical, fun bracelet. It is very versatile, also. It looks great with jeans, dress, or a skirt.